NapaShakes Education Program brings the poetry and plays of Shakespeare into the lives of students and teachers in new and exciting ways. 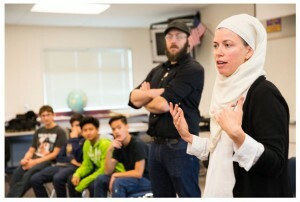 Whether exploring linguistic creativity to retell ancient stories in new poetic forms, participating in innovative programs demonstrating the eternal relevance of the Bard, or gaining unique access to industry professionals and the theatre’s greatest interpreters of the classics, future Shakespeareans will be able to experience the best of classical theatre in personally meaningful and artistically challenging forms. 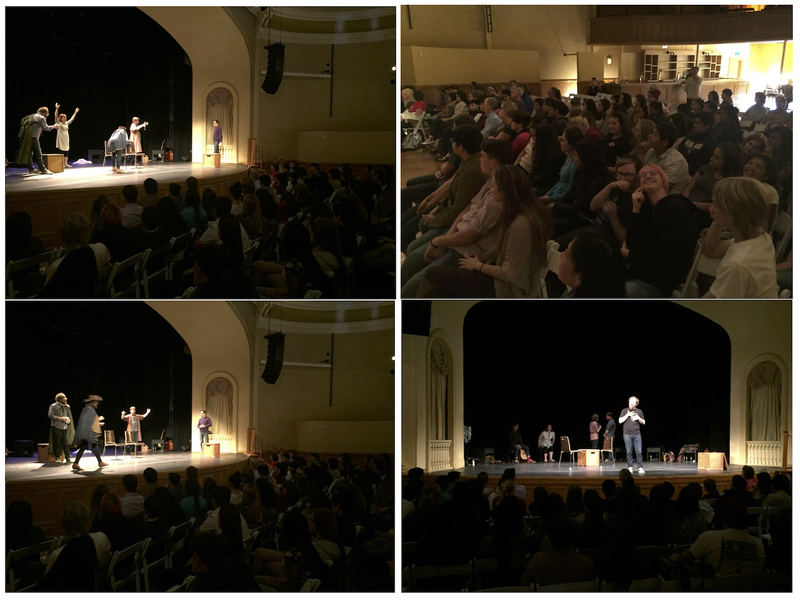 Friday, September 23 2016 : Drama, English and Music students and teachers were invited to a rehearsal of Measure + Dido at the Lincoln Theater. Folger Consort Artistic Directors Robert Eisenstein & Christopher Kendall led an interactive talkback with students to discuss the historic pairing of two monumental works, followed by an impromptu Q&A and mini-performance by the actors Derek Jacobi, Richard Clifford, Owiso Odera and Shirine Babb. Student tickets for the performance were also available. 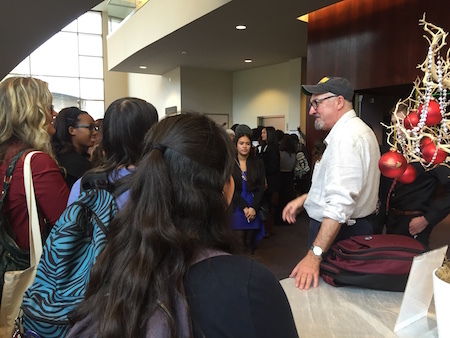 On Sunday, approximately 500 Sonoma State students were given free tickets by the university to the Weill Hall encore performance. 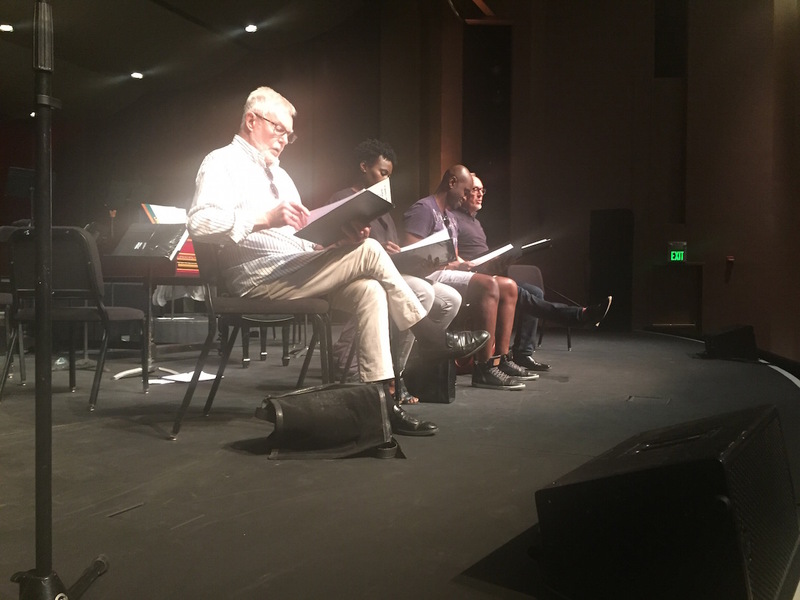 Scott Horstein, Acting Chair of the Department of Theatre Arts & Dance, Sonoma State University, SSU Arts Dramaturg, and Associate Professor of Dramaturgy & Contemporary Theatre, introduced students to star Owiso Odera after the performance. 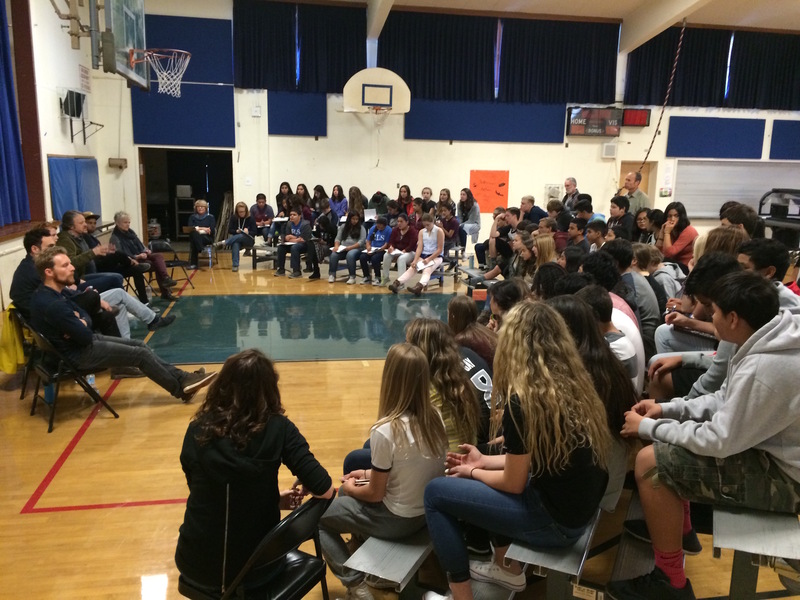 Thanks to our Education Partners Olivia Cowell and Aimee Guillot at Cafeteria Kids Theater, our dramaturg Philippa Kelly, and the students and teachers at River Middle School, New Tech High School, Stonebridge, Pacific Union College, Napa Valley College, Napa Christian Campus of Education. 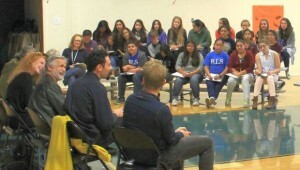 Over the course of one day, Cafeteria Kids Theater’s Aimée Guillot and NapaShakes’ Matthew Cowell led 25-minute acting workshops about William Shakespeare’s “The Tempest” for more than 300 eighth-graders at American Canyon Middle School. This volunteer event gave these students the opportunity to experience what performing Shakespeare is like, learn some acting tools and deepen their understanding of the Bard’s last play. 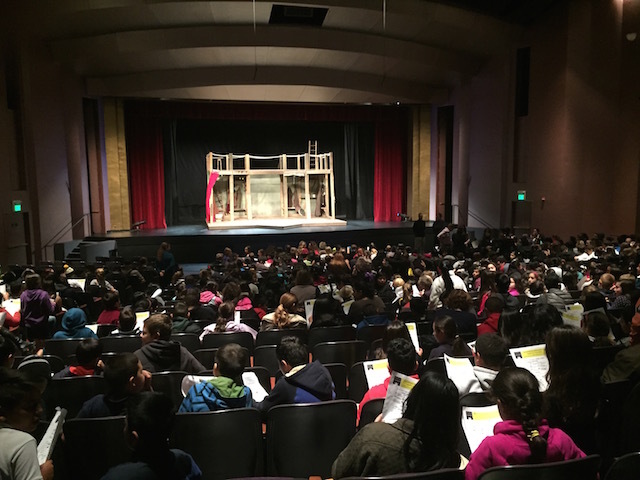 As the educational outreach partner of NapaShakes, cafeteria kids theater brings Shakespeare into the classrooms around Napa Valley. Visit the Cafeteria Kids Theater website, CafeteriaKidsTheater.org or NapaShakes’ website, NapaShakes.org, for information about bringing Shakespeare to your school. 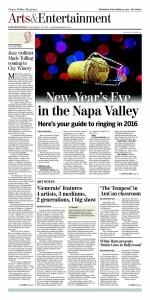 Read the St. Helena Star’s Article about these extraordinary educational events! 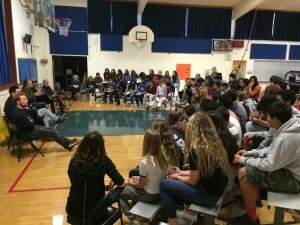 On November 13, 2015 the actors of the Shakespeare’s Globe Theatre of London and NapaShakes educator Olivia Cowell visited two St. Helena Schools: the RLS Middle School’s 8th Grade Assembly, and St. Helena High School’s Drama Class taught by Patti Coyle. 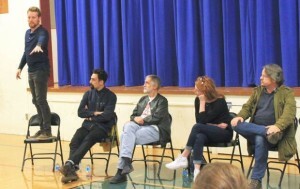 Seven actors from the Globe Theatre of London came to two St. Helena schools last Friday to talk about their experiences as professional Shakespearean actors. 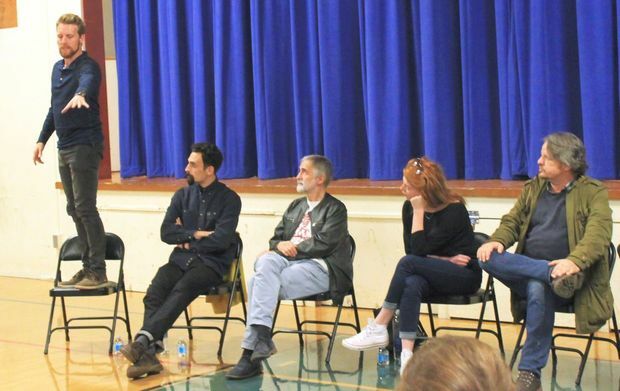 Harper, who plays Benedick in the Globe Theatre of London’s production of “Much Ado About Nothing,” was one of seven cast members who came to Robert Louis Stevenson and St. Helena High schools last Friday. At RLS they talked with eighth-graders about their craft as Shakespearean actors, and the students peppered them with questions about how they became actors, and what it was like to work professionally in the world’s most renowned Shakespearean company. 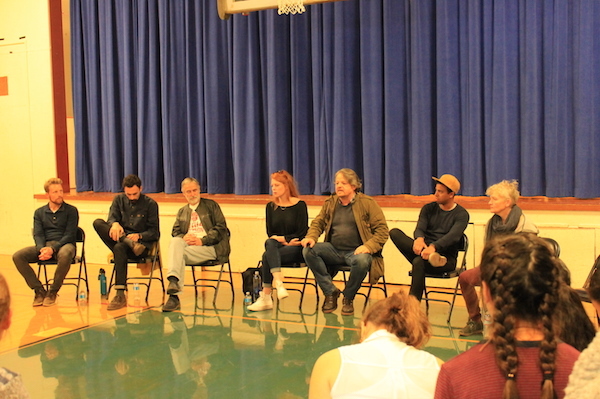 As the conversations heated up, the actors — fresh from a South American tour — came alive as they talked about their love of live theater. 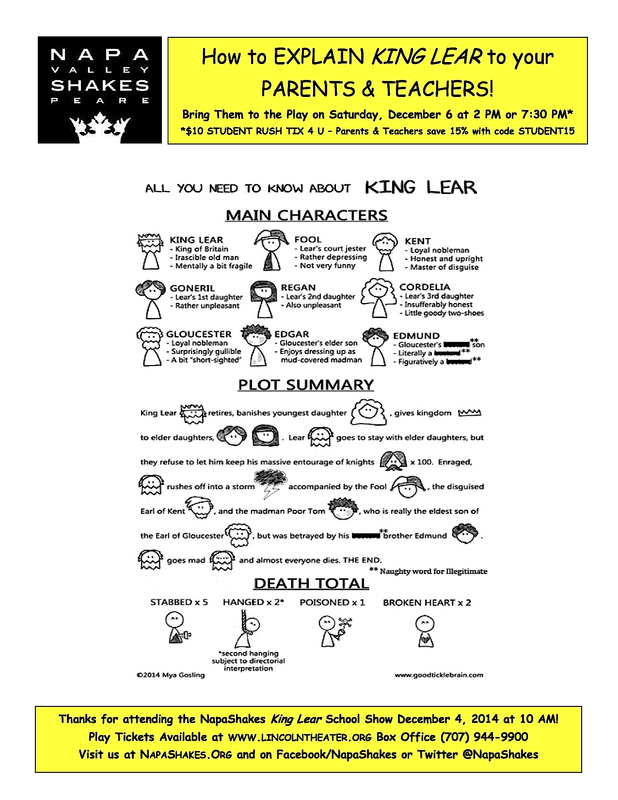 King Lear School Show 2014: 1100 Napa Valley students & educators see the Globe Theatre troupe for free! On December 6, 2014, NapaShakes presented the internationally-renowned Shakespeare’s Globe Theatre in its critically-acclaimed production of King Lear at the Lincoln Theater. This daring and inventive troupe from England is lauded as one of the finest theatre companies in the world. With tempestuous poetry shot through with touches of humor and moments of heart-rending simplicity, King Lear is one of the deepest artistic explorations of the human condition. 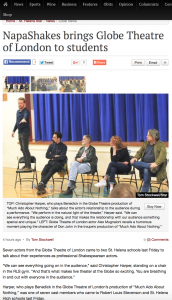 NapaShakes asked the Globe to create a special one-hour version of King Lear for this engagement, which the cast performed on December 5 at the Napa Valley Performing Arts Center in Yountville. It wasn’t easy: our plucky crew had to disassemble and reassemble the set between performances to make this school show possible. NapaShakes gathered and bused in 1100 Napa Valley students and educators coming from south in American Canyon to north in Calistoga. King Lear, staged with thrilling physicality and raw emotion by 8 actors playing multiple roles, starred British actor Joseph Marcell, best known here for his role on The Fresh Prince of Bel-Air. The cast included alums from Downton Abbey as well as Game of Thrones, and other stellar members of the Globe Theatre’s London troupe. As these photos attest, it was an enriching experience for the audience and cast alike – and the kids treated the actors like rock stars! 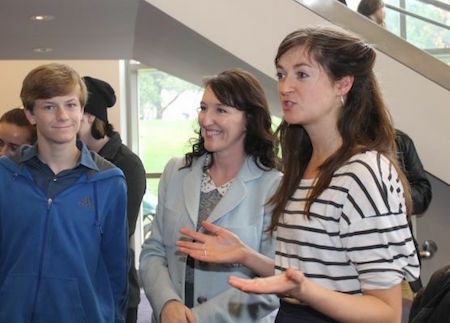 For reviews and press coverage of King Lear and the school show, see our News-Press page. The exuberant young audience gasped, laughed and cheered in all the right places. Many returned the next day with their friends and parents to see the full show. 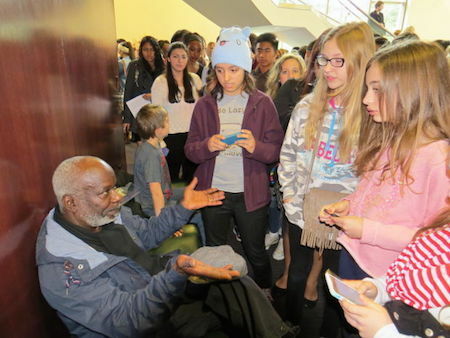 This special King Lear school show was 100% free for attendees, plus we provided $10 Student rush tickets to the full performances and discounts for their families and teachers. NapaShakes also created a special Kids Explain Lear student guide, which the adults found helpful as well.